There’s something to be said about keeping things simple. Especially when it comes to cooking. Focusing on a few key ingredients, and letting them shine through. I know sometimes I over think recipes, looking for more things to add, or ways to make them totally different. I think it’s pretty common in the food blog world too – how many times do you see a recipe title that’s almost as long as the recipe itself? By the time you’ve read the title, you forgot what half of it was, or what was even supposed to be the star of the dish. I know you are all nodding your heads – you know what I’m talking about. These cookies are exactly that – simple. A request made by the boyfriend, as oatmeal cookies are his favourite. Not oatmeal raisin – he’s not a fan of the raisins. But just oatmeal. And while I added coconut and flax as more of a texture thing, they are a fairly classic recipe. Butter. Eggs. Sugar. All those things you expect from cookies that maybe your grandma made you. And while they may look simple and plain, they are no less craveable than say, my absolute favourite cookie. Their beauty is in their simplicity – you can taste each ingredient and enjoy it as is. 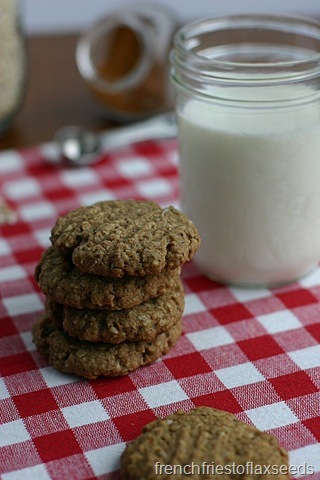 Chewy oats and coconut, with a warming hint of cinnamon and vanilla. They are crispy without being hard. Rustic and satisfying. 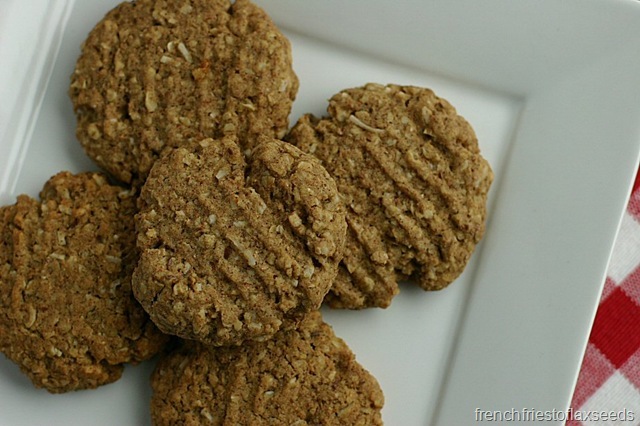 The perfect cookie to enjoy with afternoon tea or a glass of cold milk. And while they might not be fancy enough for your Christmas cookie platters, they are simple enough for a lazy winter afternoon. Because we could all use a bit of simplcity – and a cookie or 2 – in our lives. 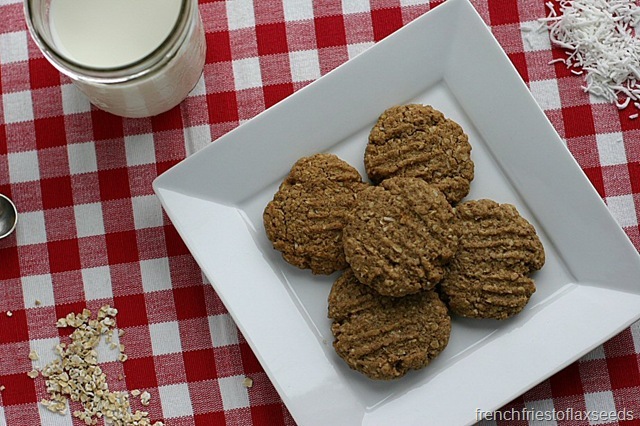 Simply delicious, these whole grain oatmeal cookies only take a few ingredients, and moments to whip up. The coconut adds great texture and flavour, and the cinnamon will have your house smelling warm and inviting. Enjoy with a tall glass of your favourite milk, or crumble them up on top of your favourite ice cream. 2. Using a stand or hand mixer, cream together butter and sugar until fluffy. Add in egg and vanilla, and mix until well combined. 3. 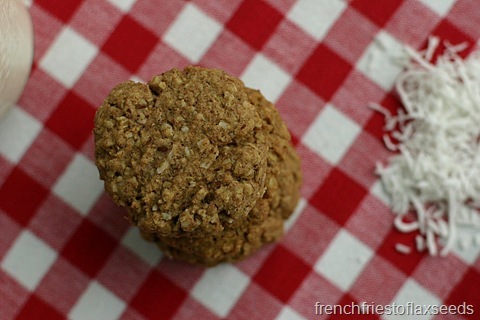 In another bowl, combine flour, oats, coconut, flax seed, baking powder, baking soda, cinnamon, and salt. Add to butter/sugar mixture, and mix until combined. 4. 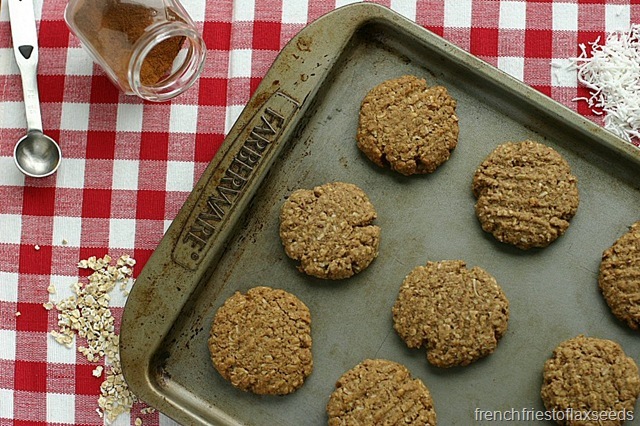 Drop by the tablespoonful onto an ungreased cookie sheet. Press dough down slightly with a fork. Bake for 7-10 minutes, or until golden brown. Note: I find most cookies don’t need a greased cookie sheet, but if you are worried about them sticking, feel free to grease or line with parchment paper. What’s your favourite kind of cookie to bake? Share links to your recipes below! I’ve never had a problem substituting coconut oil for butter in recipes, so I would imagine so. Chocolate chips would be lovely in there. Because chocolate.